Possessing the DIY video transfer know-how of a two-week-old rotting chimp, I can't do the smart thing and throw this up on YouTube. So instead I figured I could at least detail the contents of this rare making-of cassette from Interglobal (bearing Vidmark Entertainment's logo on tape) especially with every DVD only having the trailer. This video is basically a fluffy twenty minute featurette designed to show the film in an ever-idyllic light with almost robotic narration. There's no real meat and this sequel, or even the first or third, aren't exactly features screaming for a peek behind-the-scenes. As such zero mention is made of this sequel originally intended to the first in the series with producers realizing the shot back-to-back "sequel", or Missing in Action, was superior and opting to release it first. The film was shot on Mount Misery (Mount Liamuiga) on the island of Saint Kitts in the West Indies. It took two months to prep the sets with local labor with a new road built to the film's encampments. According to Chuck, karate was the premiere cinematic fighting style of the '80s. No argument there. 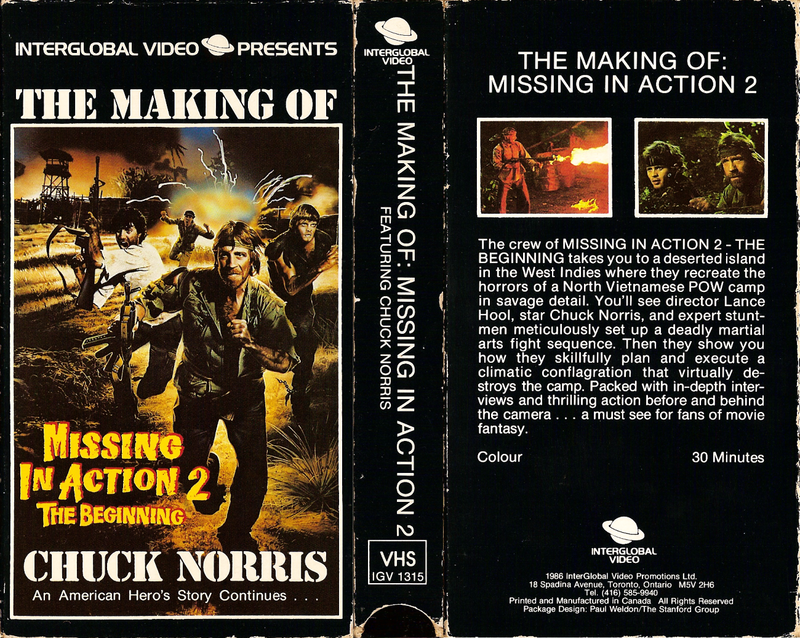 Despite Norris stating much research was done in capturing accurate torture methods and reflecting on his brother lost in Vietnam, you can tell he struggles to find much to say about the movie, "...because if the bad guy wins...then you...ermmm...lose the movie..."